I wish I could sew, I wish I could knit, I wish I had a workshop in my garage to saw and bang and hammer toys for my little one! But I don’t need any of that to make these really easy toys for him. 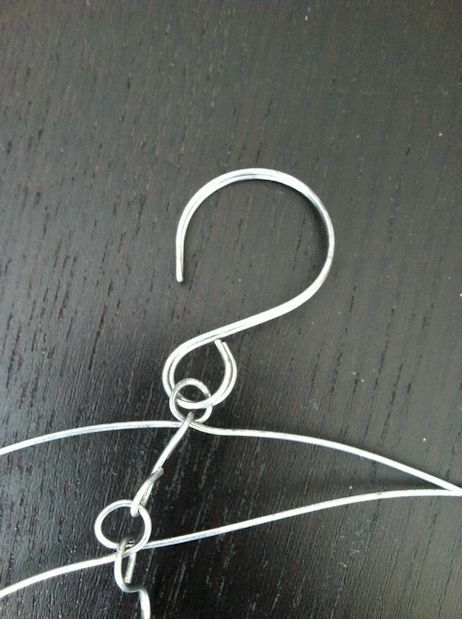 No sewing or sawing required. Give baby a wooden stick or a scarf and they will think of ways to play all day long. And babies this small (Aditya is 6 months old) are fascinated by everything! I don’t know if I can call the toys I made for him toys, but I know that YOU can make them too. And all materials are right at your home! 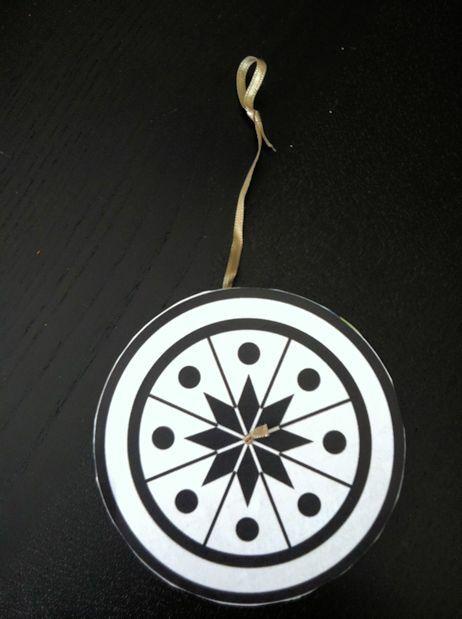 I was inspired by Montessori mobiles to buy a large jingle bell – one of their sensory mobiles is a jingle on a string or a ribbon. See, here goes the first toy! And the idea for the second one was conceived simply because the jingle bells came in a pack of two:) So I was thinking what to do with the second one and noticed, how Aditya loves his fabric ball with a jingle inside. I took a wash cloth (because of the texture, but you can take a piece of flannel or cotton fabric, or any other, for that matter) and this particular one had a frog face on it, and I thought it would be fun if I positioned the face so that it looks like frog’s head. I put the jingle inside the cloth, tied with a ribbon and tadaa! 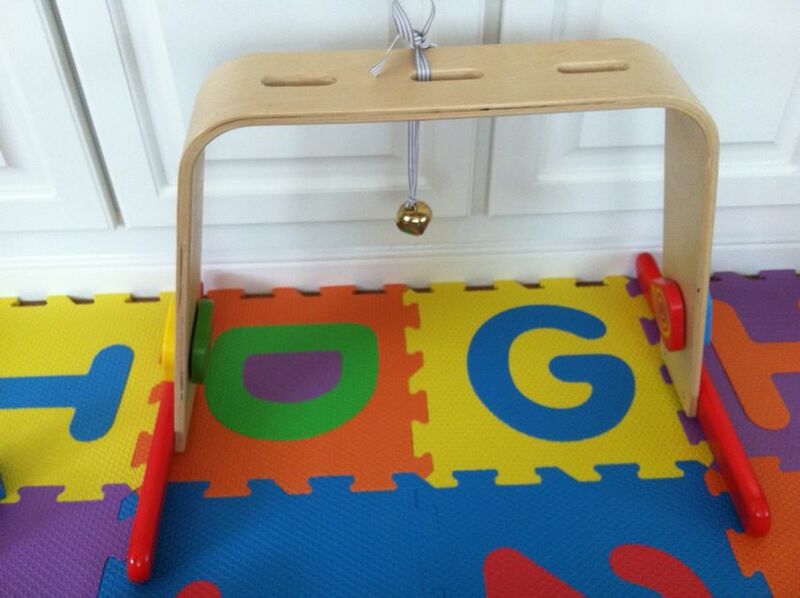 This is a great tip for traveling too, if your baby gets tired of the old toys (or you forget to take any with you). The cloth is good enough as a makeshift doll without the bell inside. 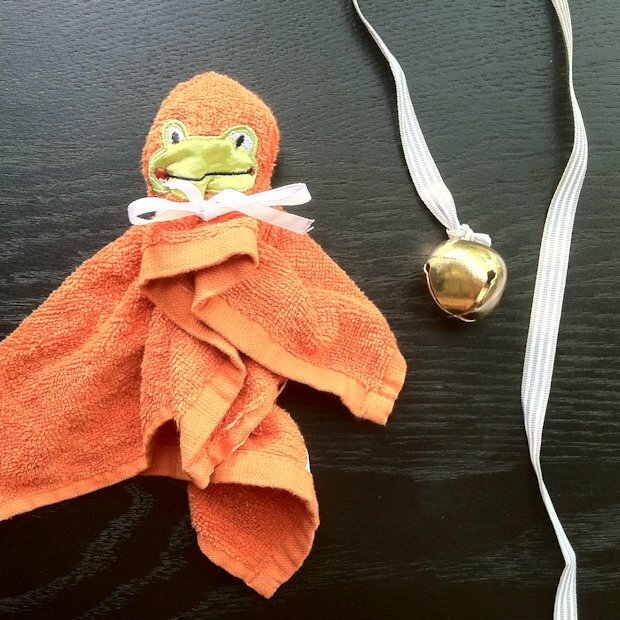 There are many ways to play with these toys, but please be very careful, especially with the jingle on a string, as it may pose a strangling risk. Always make sure that the end is tied in a way your baby can’t get the string around his or her neck and supervise their discovery time with the toy! 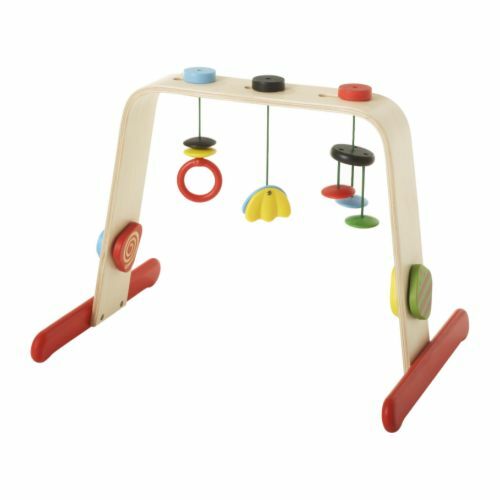 I like using the jingle bell on this IKEA wooden gym – I just strip the hanging toys it comes with and tie the jingle for a change. It seems very simple, but Aditya just loves to bat, bat, bat at it! 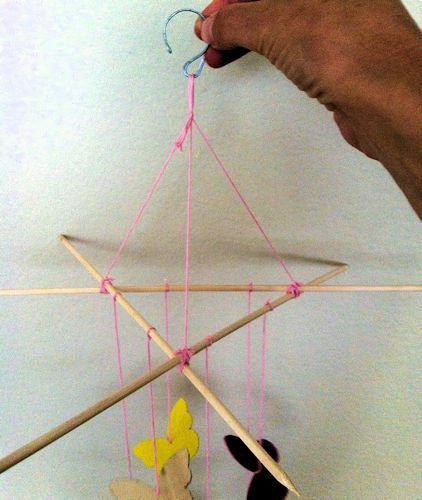 What simple toys do you make for your kids? 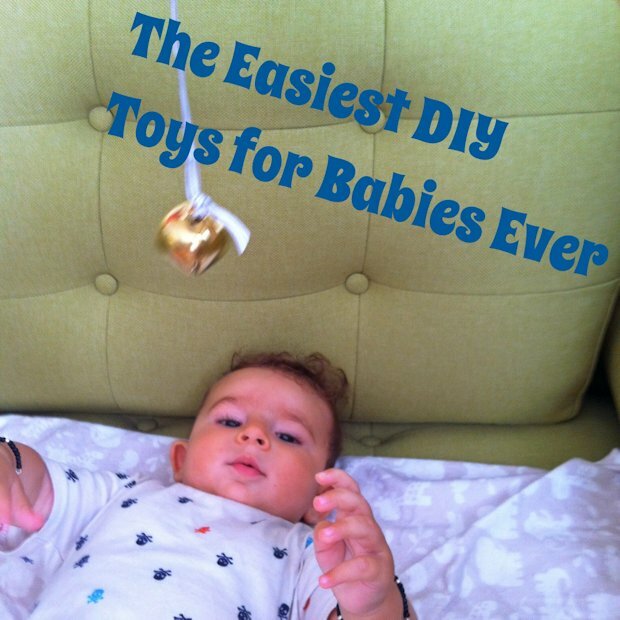 Do you prefer making at least some toys or other items for your child to just buying everything? 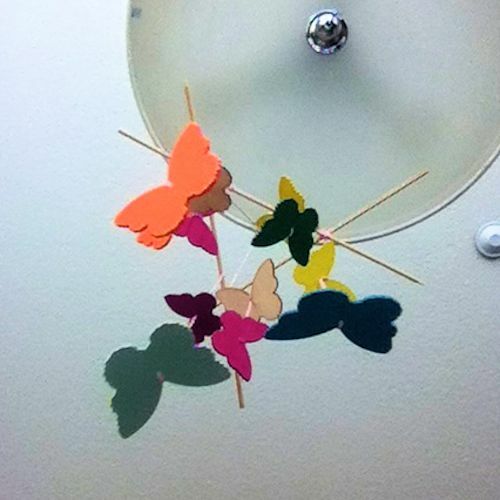 I found these butterflies at Michael’s in the scrapbooking section – the package had 12 butterflies made of thin plywood, but if you are making yours from scratch, stock paper with any shapes will do. There are all sorts of paper punches to make your job easier. 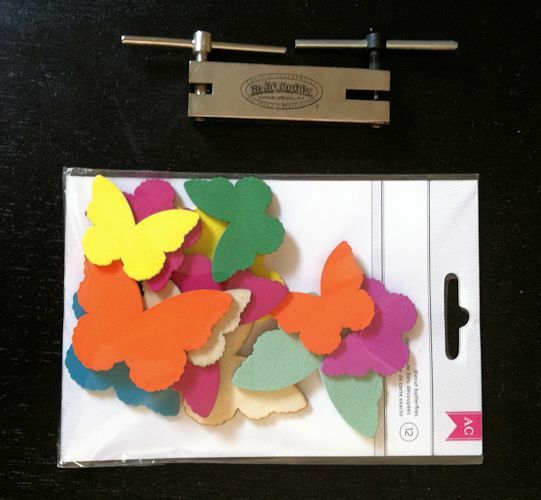 Make a hole in each butterfly with a hole punch. 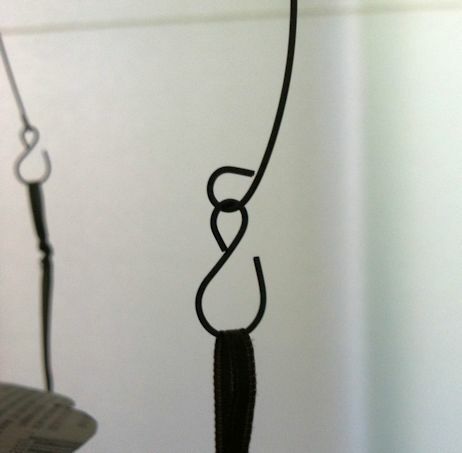 String one butterfly at the end of a thread and secure with a knot. 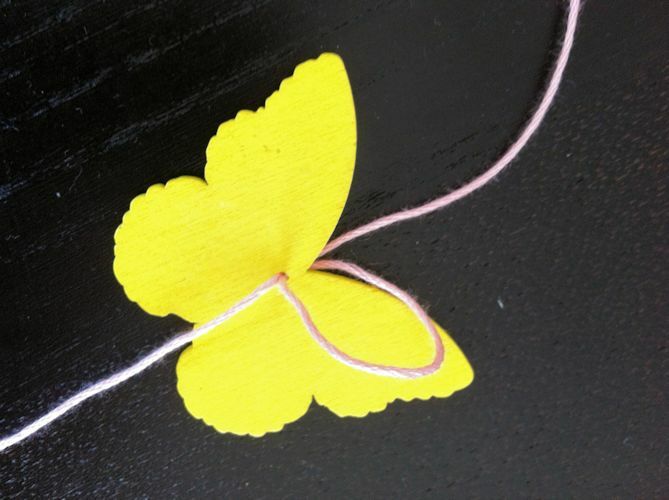 Add another butterfly and make a loop or a knot to secure the second butterfly. Repeat for all butterflies until they are strung on threads in twos. This post contains an affiliate link to Brillkids.com. This one is for the smallest babies and I wish I made it when he was really tiny. 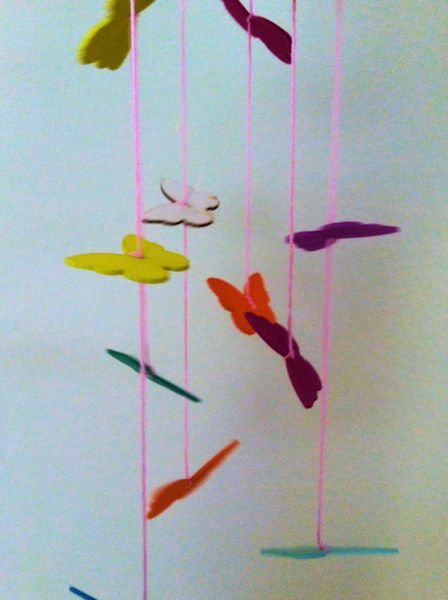 He enjoys it anyway, but I recommend this as one of the very first mobiles for a baby. 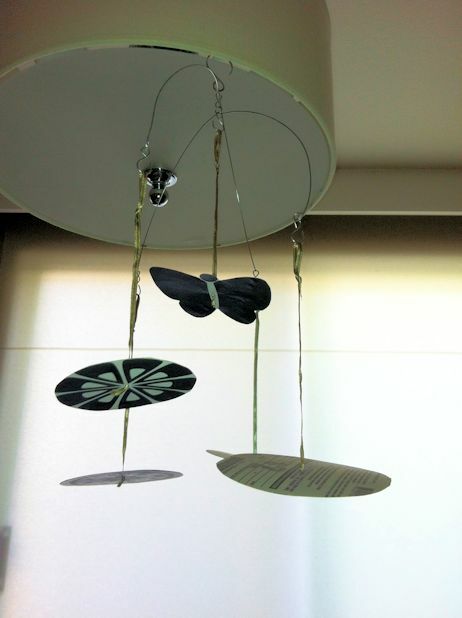 The mobile is Montessori inspired and covers the principles of many early education methods. 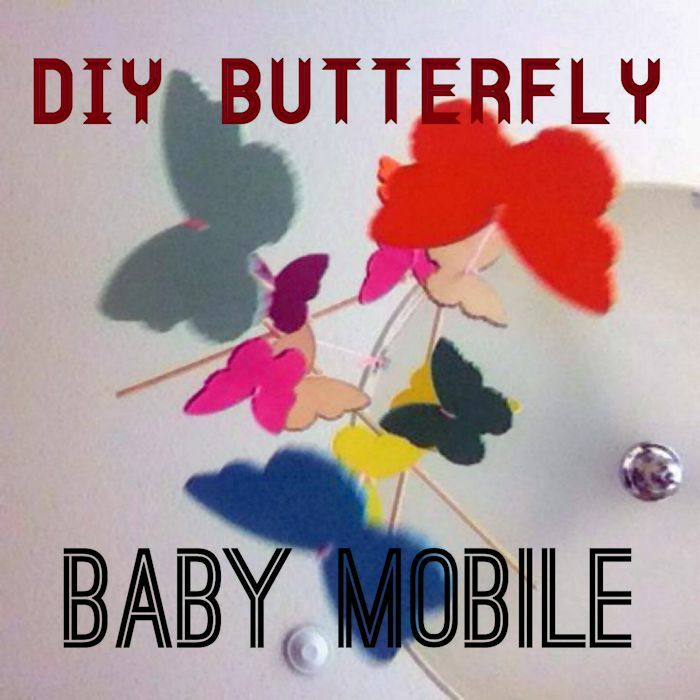 There are lots of ways you can modify and customize your mobile. I didn’t use anybody else’s instructions, so I had to figure out some things and kinks along the way, but I hope my half-baked instructions will help you or at least inspire you! 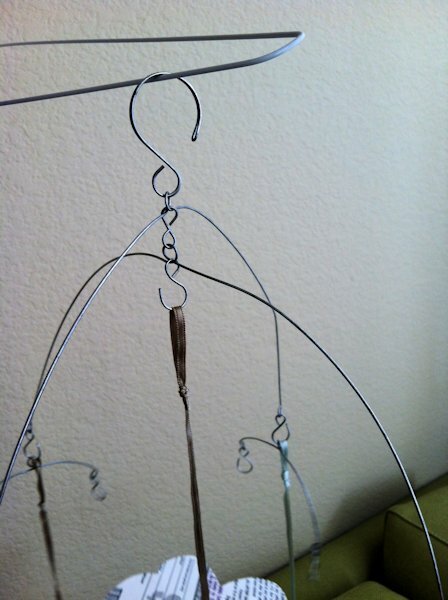 There was a small change along the way: the wooden skewers didn’t work very well, so I changed them for a WIRE. First I cut out the shapes I selected and glued them onto the cardstock (non-winning tickets, I mean;))) and then made a hole in the middle to pull a piece of ribbon through. 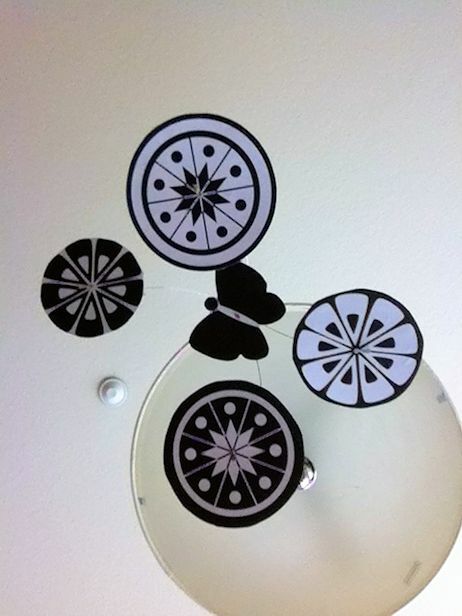 I made a little loop at the end – this is how you will hang the pictures. You can tie them directly to your mobile base, but I wanted to make them interchangeable and use different pictures after a week. 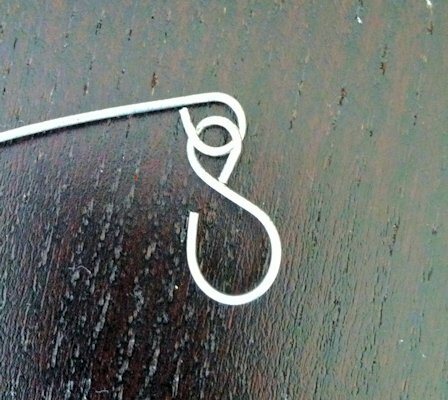 The I made a base with wire – from the top: a large hook (to hang it wherever you fancy), one wire arm – looks like an arch with a loop in the middle and on each end), loop to hang both arms above each other and the second arm – same arch with a loop in the middle and on each end. 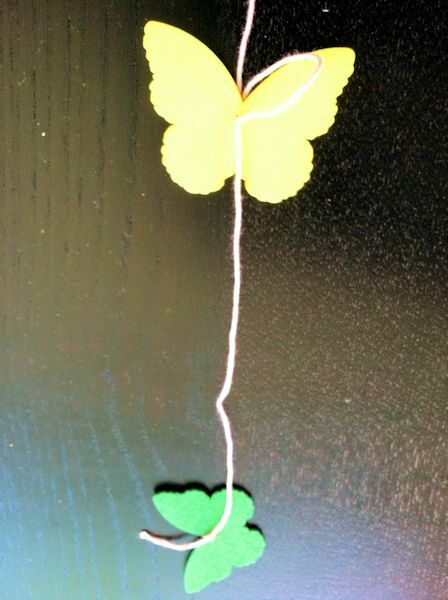 You will want the two arms to form a cross, so the mobile’s pictures are spread out evenly. Hang your pictures and voila! I will be delighted if you share your mobile ideas with me! And as promised, when I have time, I will post other mobiles. 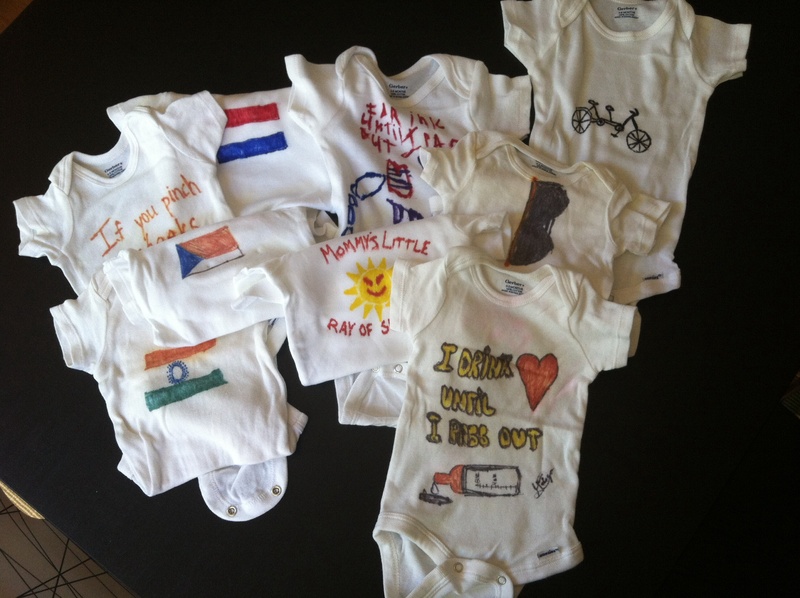 I bought 10 white onesies (5 for 3-6 months and 5 for 0-3 months size) and a pack of colourful Sharpies. Then I printed some funny T-shirt quotes as an inspiration and gave it all to the friend who was organizing my baby shower. Take into account the number of guests attending and buy about half that many onesies or shirts (not everyone is into crafts and couples sometimes collaborate) – but if buy too many, it’s OK, you have white onesies to give to someone else, use them plain or decorate them yourself in those long evenings when you’re out of work and enjoying your last days before the joyous arrival! Let your guests know there is no do-over. If they make a mistake, it will stay. Make sure you collaborate with your host, so they have an adequate space ready – a work table with a cover or something similar. You wouldn’t want your guests to leave marker stains on a friend’s fancy couch! Strictly black & white version is very cute too. Or choose another marker colour and use only that. 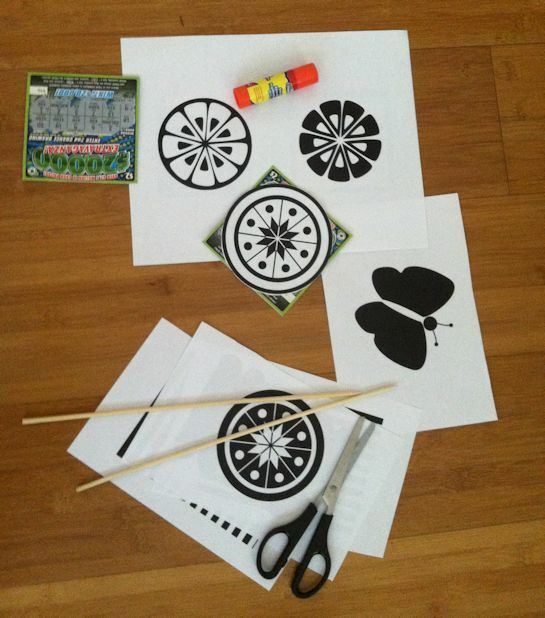 Do this on your kid’s birthday – small kiddo = adults do the crafting. Older kiddo = his/ her friends make t-shirts for him! Dyed shirts with bleach (the design will be white on coloured shirt) >>> careful, this one would be messy!